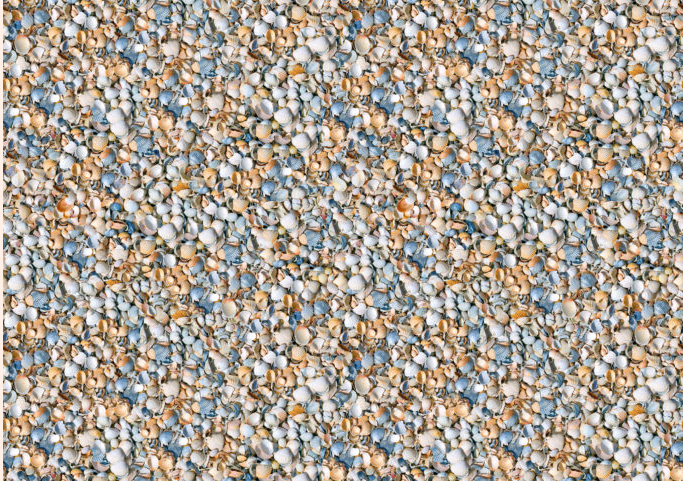 Seashell is a Shell Texture Vinyl Flooring design that features a photographic, realistic array of tiny, neutral-coloured pebbles on a beach, creating a textured, unique space in any domestic or commercial setting. 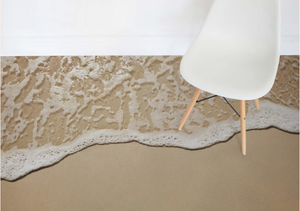 Atrafloor brings you the most interesting photographic designs like Seashell in high-definition on thoroughly durable, waterproof, luxury vinyl flooring. The detailed pattern of our “Tarantula” Galaxy Space Vinyl Flooring combines design and sophistication making it a trendy addition for your home. 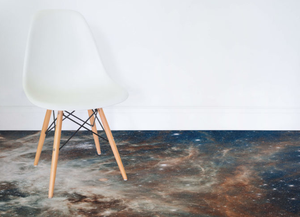 It features photographic art of outer space that is sure to be the focal point of any room. Atrafloor brings you the most interesting photographic designs like Tarantula in high-definition on thoroughly durable, waterproof, luxury vinyl flooring. 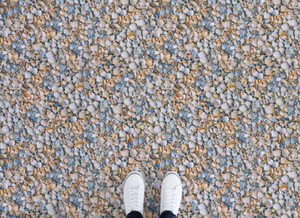 Stepping Stones is a Stone Paving Vinyl Flooring design that features faux effect stone slabs arranged in an eye-pleasing pattern, which can be used outside or within the home to bring the outdoors in. Atrafloor brings you the unique photographic designs like Stepping Stones in high-definition on thoroughly durable, waterproof, luxury vinyl flooring. Our Kids Brick Pattern Flooring is a bedroom decoration idea that any child will simply adore. 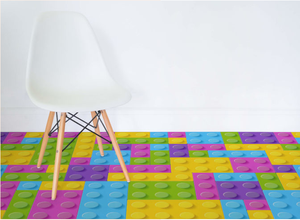 Featuring an array of brilliantly bright, exciting block colors, this is a superb flooring design that really make their bedroom or play area a fun place to be. 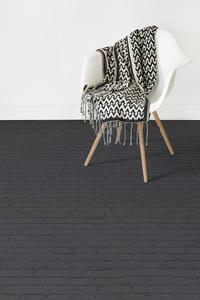 Our vinyl flooring is thoroughly durable, waterproof and child-friendly. 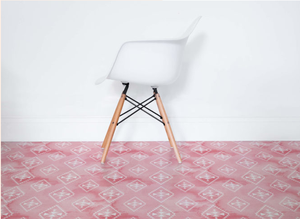 Zolin is our Tie-Dye Pattern Vinyl Flooring design, featuring an African-inspired diamond print against a watercolour tie-dye effect in neon pink tones. 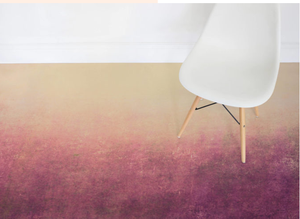 Zolin is available in its original pink colour, or our in-house designers can customise this design using your own colour choice, to ensure your flooring matches the colour scheme of your interiors. Create a unique, statement space by incorporating a bright, intriguing design on vinyl flooring. 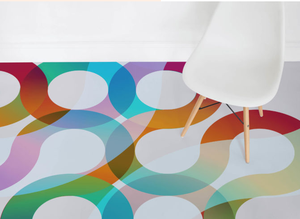 Our 70’s Retro Swirl Vinyl Flooring is funky design called “Groovy” that incorporates a whole spectrum of colour to give your interior decor a lively, bright and artsy vibe. A unique design that is perfect for those looking to give their decor a more vibrant feel, our Groovy Vinyl Flooring would look brilliant in any room of the home or workplace as a stand-out, high-design feature. Highly durable & easy to install. 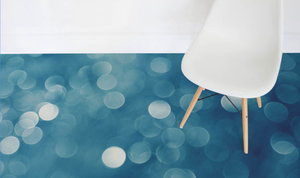 Haze is a staggeringly beautiful flooring idea that depicts out of focus raindrops set against a calming blue background. This is a wonderfully soft design that we believe will add a truly unique, relaxed atmosphere in your home at the same time as providing your interior décor with a real depth and dose of color that is guaranteed to leave your home looking amazing. 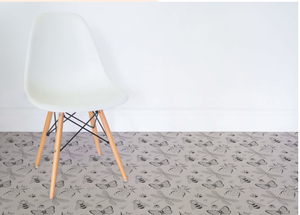 Fabre is an Insect Pattern Vinyl Flooring design that features a motif pattern of various intricate illustrated insects with a sophisticated, vintage-style colour scheme. Fabre is available in Neutral, Blue and Green. Or, our in-house designers can customise the Fabre design using your own colour choices, to ensure your flooring matches the color scheme of your interiors. 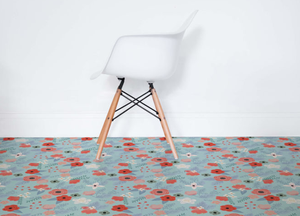 Summer is a Floral Pattern Vinyl Flooring design that features bright red a coral flower illustrations against a soft, sky blue background. And elements of fun, femininity and floral beauty to your home or commercial space with a characterful, unique flooring design. 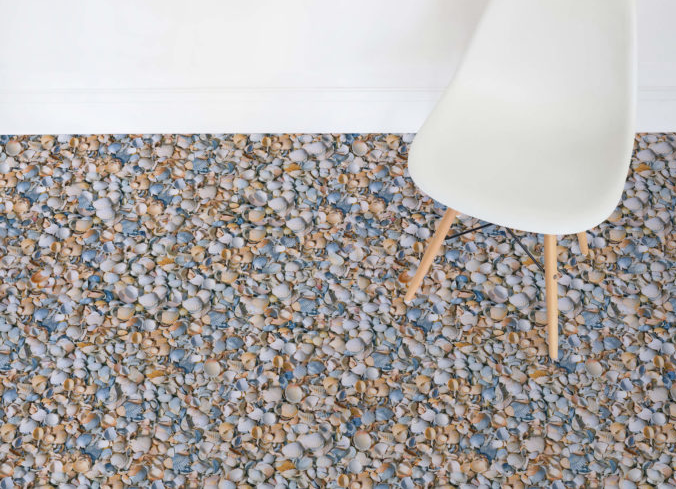 Leaf is a wonderfully delicate flooring design that is perfect for those that want to bring the decorative beauty of the outdoors inside. 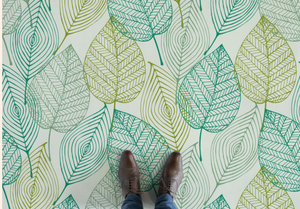 With a glorious array of green tones and decorative leaves, Leaf is an intricate yet subtle flooring concept that will leave your home looking spectacular. 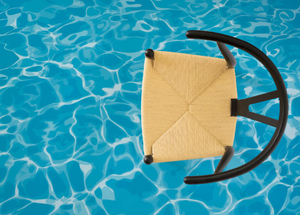 Pool I is a Water Effect Vinyl Flooring design that features a realistic, illustrative water effect that completely transforms a room. This design is perfect for creating a bold design statement in any commercial or domestic space. 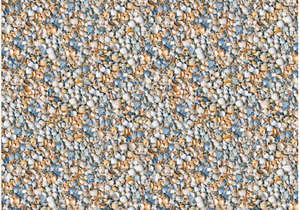 Ashore is a Beach Effect Vinyl Flooring design that features a beautiful photographic image of a beach. 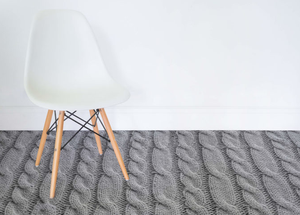 Create a relaxing space in your commercial or domestic space and create the unique illusion of calming wave ripples and a cool sandy beach on your floor. 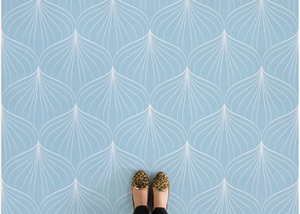 White Flower is a Floral Graphic Vinyl Flooring design featuring vintage-style, illustrative white flowers against a soft powder blue background. 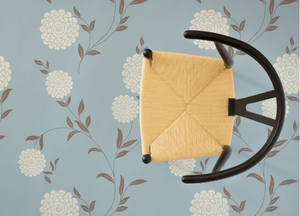 Feminise and soften up your floor space with a subtle floral design. Atrafloor is passionate about bringing high-design concepts to flooring with creations like White Flower, to ensure that you can achieve a space of unique interior design. 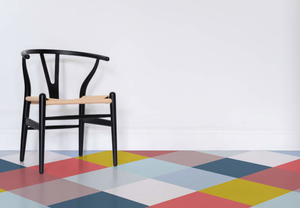 Carousel is a Patchwork Kids Flooring design that features geometrics in colorful tones with an overlay effect. This playful design is perfect for a child’s bedroom or play area to add some charming color and really make their room a unique, personal space. 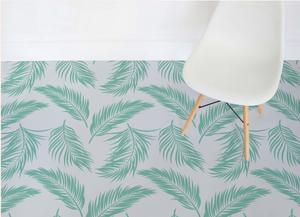 Hawaii is a Green Tropical Leaf Vinyl Flooring design that features a bright, fresh leaf pattern as a modern, minimalist take on interior design’s prominent obsession with tropical trends. Atrafloor is passionate about bringing high-design concepts to flooring with creations like Hawaii to ensure that you can achieve a space of unique interior design. 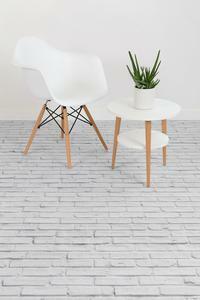 Vanille is a White Brick Effect Vinyl Flooring design whitewashed to create a minimalist, modern look. Atrafloor brings brick design to floors in high-definition on thoroughly durable, waterproof, luxury vinyl flooring. 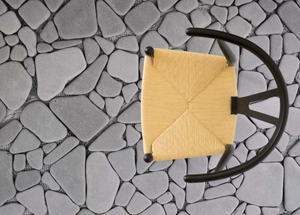 Vanille is suitable for both commercial and domestic use, to incorporate a clean, contemporary style into any space. 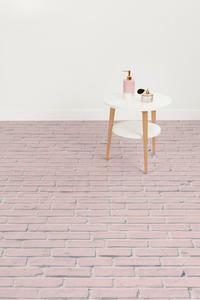 Our Bonbon design is a Pink Brick Effect Vinyl Flooring inspired by strawberry ice cream that transforms a room into a pastel paradise. This unique design is a trendy take on industrial brick surfaces that adds a pop of fresh color to a room along with an interesting, photographic faux effect. 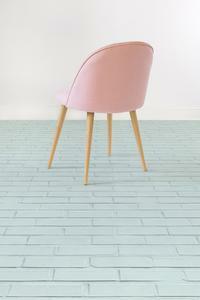 Our Mint design is a Pastel Brick Effect Vinyl Flooring inspired by pale green mint ice cream that completely transforms a room. This unique design is a trendy take on industrial brick surfaces that adds a fresh pop of minty color to a room along with an interesting, photographic faux effect. Coal is a Black Brick Effect Vinyl Flooring design that transforms a room into with its deep matte black color. This unique design is a cool take on industrial brick surfaces, creating the perfect dark flooring solution with an interesting, photographic faux effect. 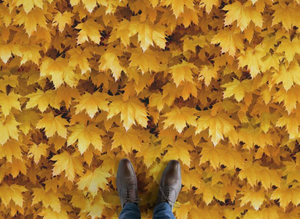 Set the scene for autumn with our Harvest vinyl flooring, featuring fallen leaves in an autumnal orange hue. Perfect for adding warm colours to your interiors and an eye-catching design feature. Atrafloor brings you the most interesting photography flooring designs like Harvest in high-definition on thoroughly durable, waterproof, luxury vinyl flooring. 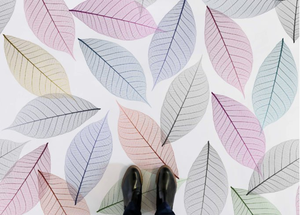 Skeleton Leaves is a Leaf Structure Flooring design that features the effect of light shining through softly multicolored leaves, creating a delicate, textured and playful design. This flooring is perfect for incorporating fun color into a space while keeping your interiors looking stylish and contemporary. 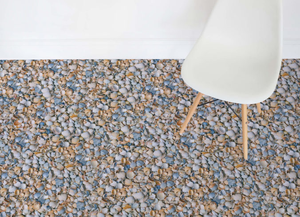 Verdure is a Leaf Foliage Vinyl Flooring design, with a photographic grass effect that brings the outdoors in. 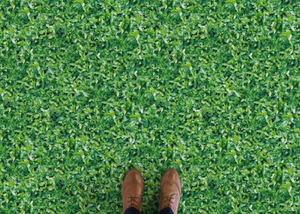 Create a lush green environment with this leaf effect flooring that can even be installed in outside areas. Atrafloor brings you the most interesting photographic designs like Verdure in high-definition on thoroughly durable, waterproof, luxury vinyl flooring. Our Abstract Angle flooring is a fabulously different flooring design that will leave a completely unique mark on your home. 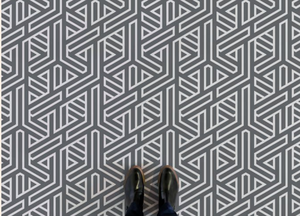 The simple grey and off-white colour contrast only helps to underline the complexity of the art deco inspired angular pattern to create an amazing visual effect that will leave your home flooring looking truly spectacular. Suitable for homes and commercial use. Adrift is available in its original powder Blue palette, or our in-house designers can customize this design using your own color choices, to ensure your flooring matches the color scheme of your interiors. Price: $69/m2 Suitable for homes and commercial use. Ships within 12-15 working days. Our mission is to offer superb design on cutting-edge new products. We design our flooring to improve the experience people have in the spaces they occupy. 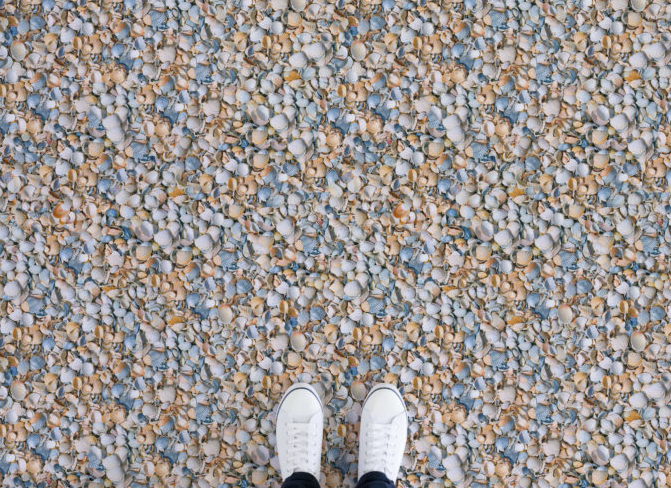 We think that flooring is often overlooked as a design solution, and we’re committed to making it an exciting, innovative and fun part of interior design.